But also of Christmas future. Or, perhaps, the spirit (pneuma) of the season. Merry Christmas to all! We’ll see you back here in 2009. 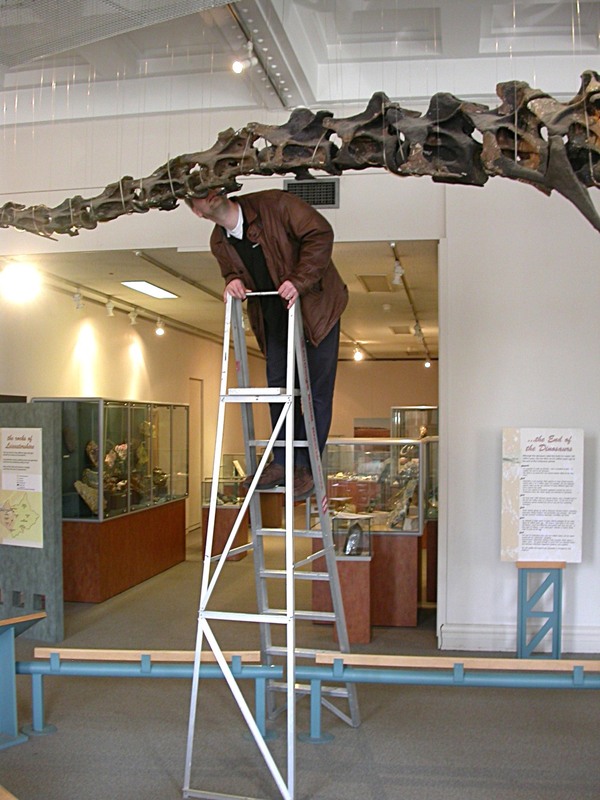 In view of all the awesome that is the Humboldt Museum’s gigantic brachiosaur mount, it’s too easy to overlook another nearly-complete Tendaguru sauropod, mounted in the very same hall, that is also worthy of respect and, yes, awe. Ladies and gentlemen, I give you: Dicraeosaurus hansemanni! Dicraeosaurus hansemanni mounted skeleton, Humboldt Museum, Berlin. Anterolateral view. Matt Wedel for scale. Dicraeosaurus is a member of Dicraeosauridae, the family that, together with Diplodocidae makes up the whip-tailed clade Flagellicaudata; which in turn, with rebbachisaurids and a few bits and pieces, makes up the great neosauropod clade Diplodocoidea. 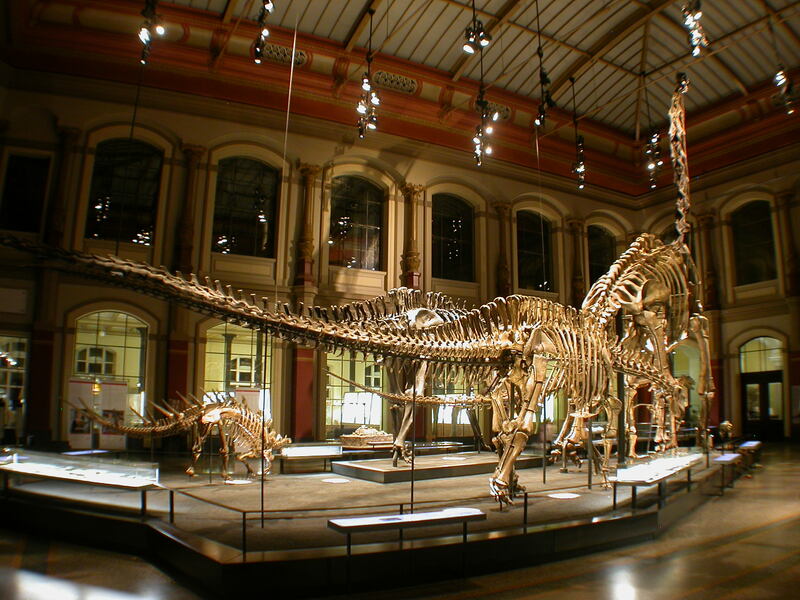 Dicraeosaurus was first named and briefly described by Janensch (1914:83); typically, Janensch went on to make full and detailed descriptions of its osteology, and also to describe the mounted skeleton (Janensch 1936). It’s not really apparent from the photo above, but Dicraeosaurus is really small — like, embarrassingly small. Especially when it’s standing next to Brachiosaurus brancai. Gunga et al. (1999) estimated its mass at 12810 kg, but since that was the same paper that estimated B. b. at 74420 kg, based on a similarly grotesque baloon model, we can probably assume an accurate mass would be about one third of that, or 4000-5000 kg. Smaller than a big elephant. (I don’t know of any other published mass estimates for Dicraeosaurus; if I’ve missed any, please shout.) 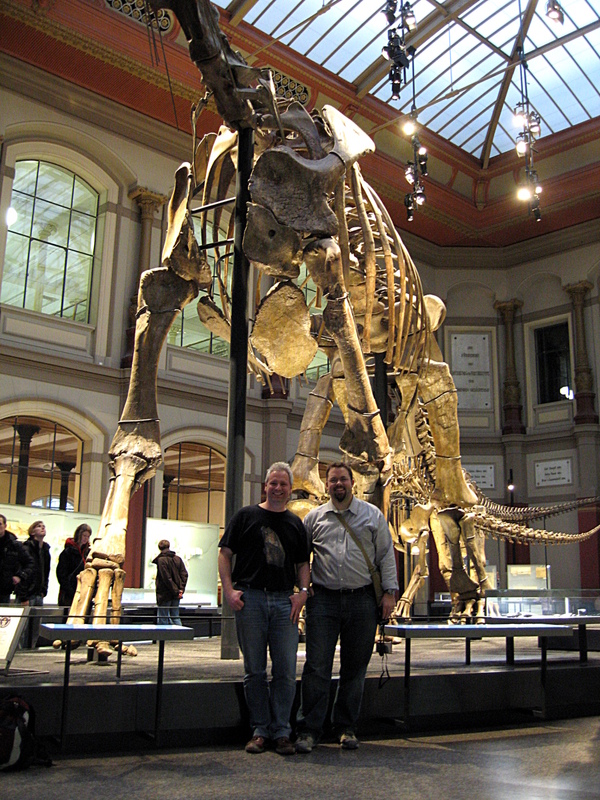 This is typical for dicraeosaurs: the South American Amargasaurus and Brachytrachelopan are even smaller. Dicraeosaurus neck. Left lateral view. Check this out. The spines of C2-4 slope backwards; that of C5 is upright; from C6 onwards, they slope forwards. Very strange. Oh, and this is real: the verts are in good shape, and definitely not distorted. 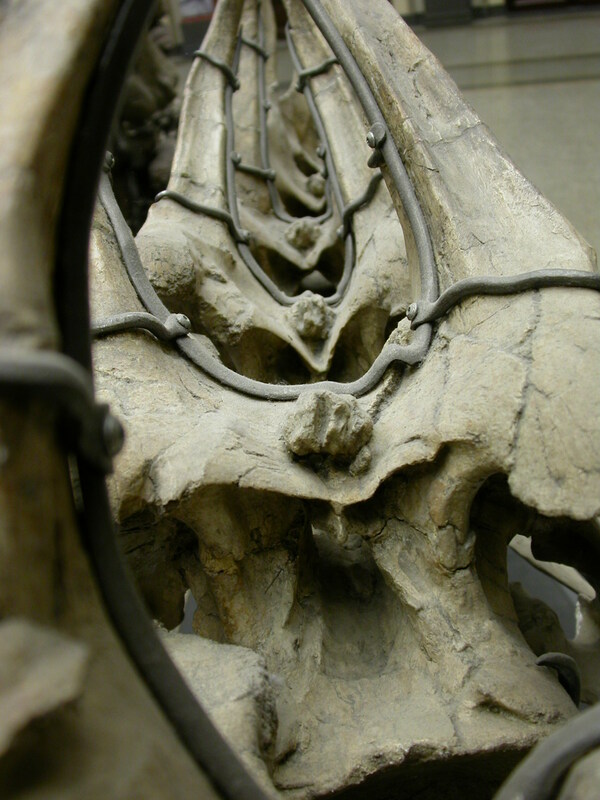 Ligament attachment knobs in intermetapophyseal trough of Dicraeosaurus neck. Posterodorsal view. Happily, the museum’s crack conservation unit swung into action immediately — I mean, literally within an hour — and I believe that rib is now back in place and as good as new. Frightening. The tall, bifid neural spines of dicraeosaurs continue into the dorsal sequence, resulting in a “tall back” that carries through the sacrum and into the anterior part of the tail — as the posterolateral view below sort of shows. Just as the dicraeosaurid neck-shortening trend is taken to its extreme by Brachytrachelopan, so the elongation of neural spines reaches its apotheosis in Amargasaurus, which we must remember to show you one of these days. 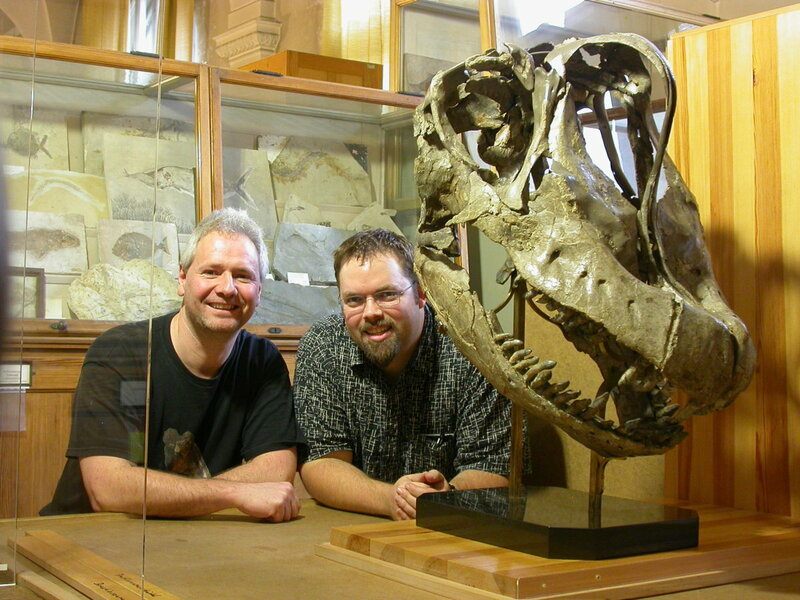 A farewell to Dicraeosaurus. Right posterolateral view. Also in view: the stinkin' stegosaur Kentrosaurus (left), Diplodocus (nearly obscured by Dicraeosaurus) and Brachiosaurus brancai (right and, er, top). David Hone, of Archosaur Musings fame, has sent me this photograph of the Dicraeosaurus mount in the process of being put together by the good people at RCI. 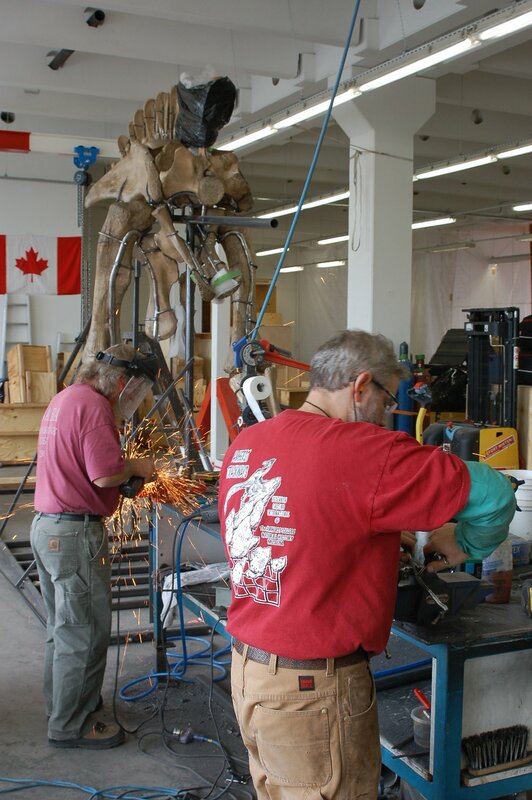 RCI building the Humboldt Dicraeosaurus mount. Janensch, Werner. 1914. 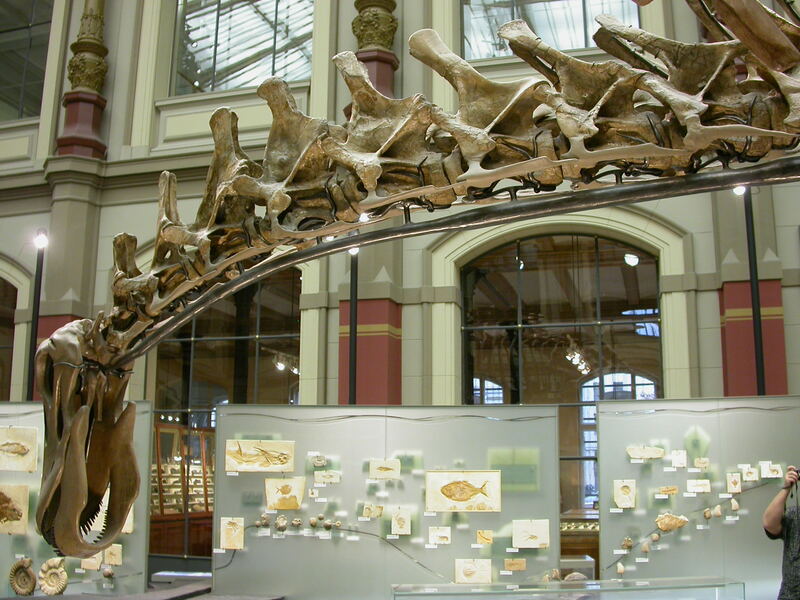 Ubersicht uber der Wirbeltierfauna der Tendaguru-Schichten nebst einer kurzen Charakterisierung der neu aufgefuhrten Arten von Sauropoden. 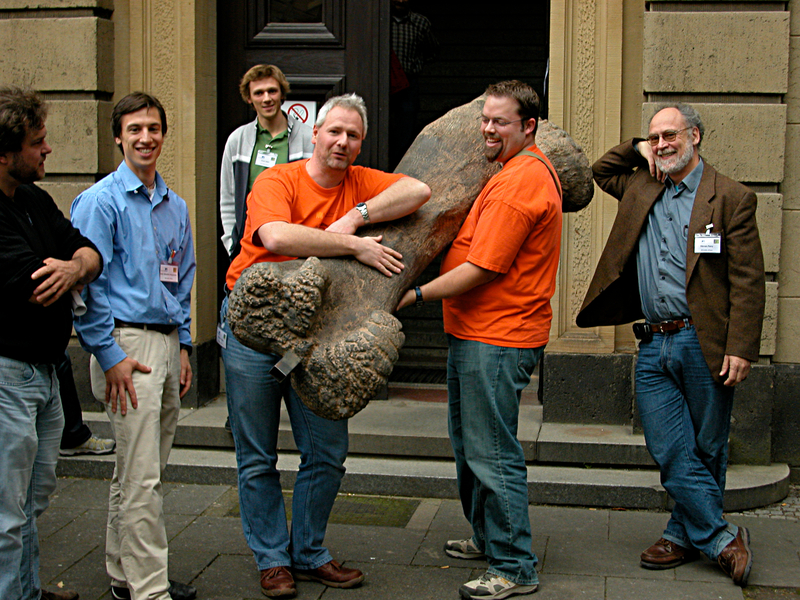 Archiv fur Biontologie, Berlin, III, 1 (1), pp. 81-110. Janensch, W. 1936. Ein aufgestelltes Skelett von Dicraeosaurus hansemanni. Palaeontographica (suppl. 7), 299–308. 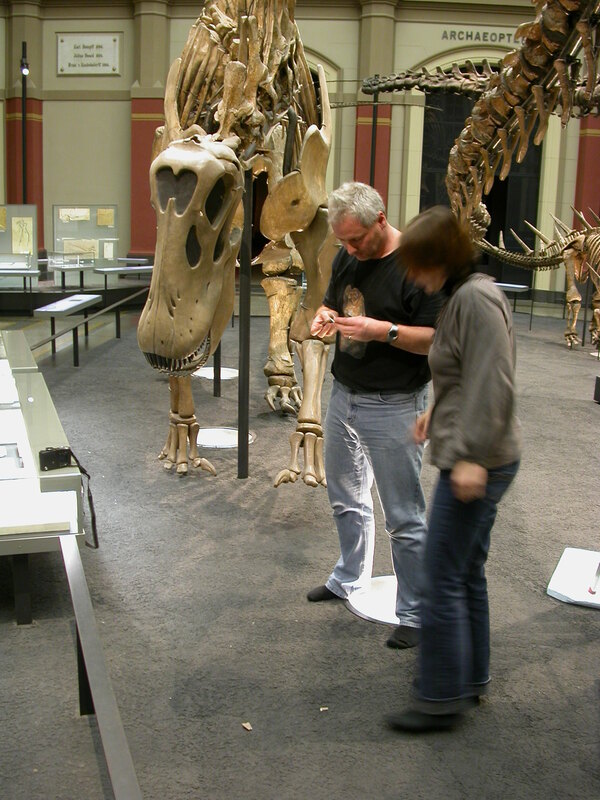 Here’s Mike checking out the cervicals of the mounted Cetiosaurus at the Leicester City Museum back in 2004. 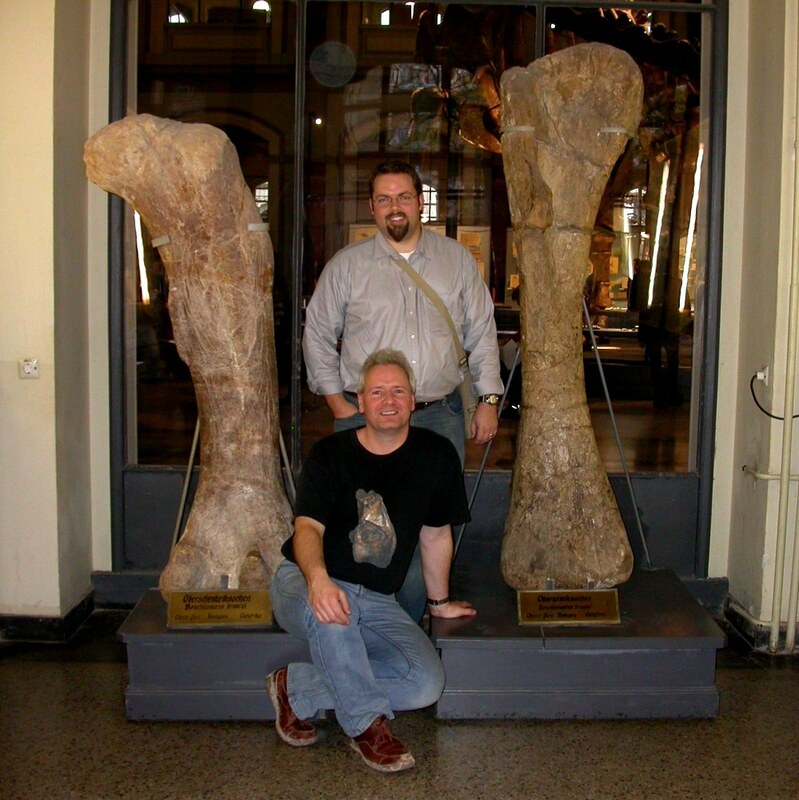 I like this photo because I was a ways back from Mike, and Cetiosaurus was not a particularly large or long-necked sauropod (actually in scientific terms I would describe it as being on the puny side of average), but the cervical series still goes right across the frame. Nothing but neck, as the youngsters say. 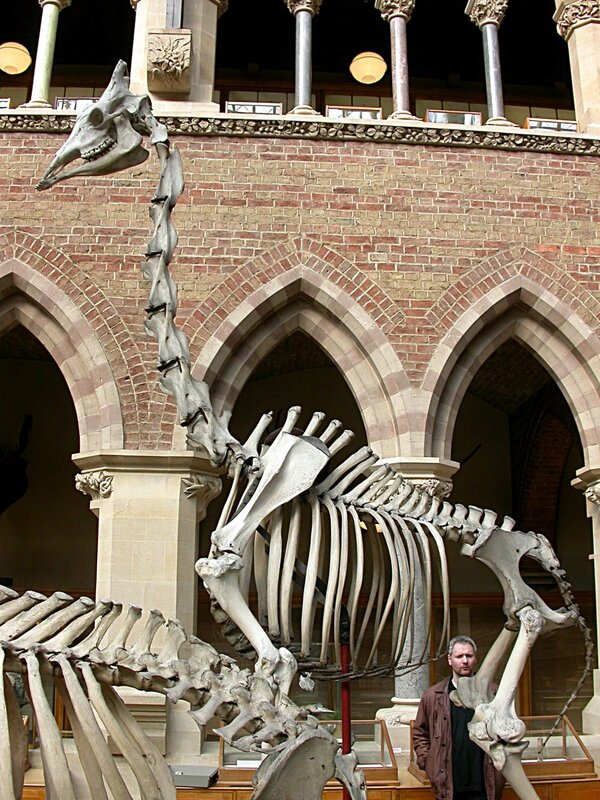 Just try to grasp Mike’s deep unhappiness as he ponders the world’s–snort!–tallest mammal, at Oxford that same spring. A 3D reconstruction of the paranasal sinuses in a human (from Koppe et al. 1999). You also have paratympanic sinuses that pneumatize the mastoid process of the temporal bone (feel for an inferiorly-directed, thumb-size protuberance right behind each ear). An x-ray of a pig skull, from here. Can you see the outline of the brain-shaped endocranial cavity? How about in this x-ray of a rhino skull? Image courtesy of Kent Sanders. A sectioned cow skull. The bottom half of the endocranial cavity is exposed in the horizontal cut. The vertical cut shows the tiers of sinuses that make up most of the volume of the skull. I think that the middle tier (the large, butterfly-shaped space) is the front part of the endocranial cavity and housed the most rostral bits of the brain; note that it is completely surrounded by sinuses. Part of a bighorn sheep skull. The pneumatic horncores of bighorns are a useful antidote to the idea that pneumatic bones must be weak. A cross-section of an elephant skull, courtesy of Project Gutenberg. The cavity at the back marked ‘b’ is the endocranial cavity that holds the brain. The big tube running through the middle is the nasal airway. Everything else is pneumatic. Note that the brain is entirely surrounded by sinuses. 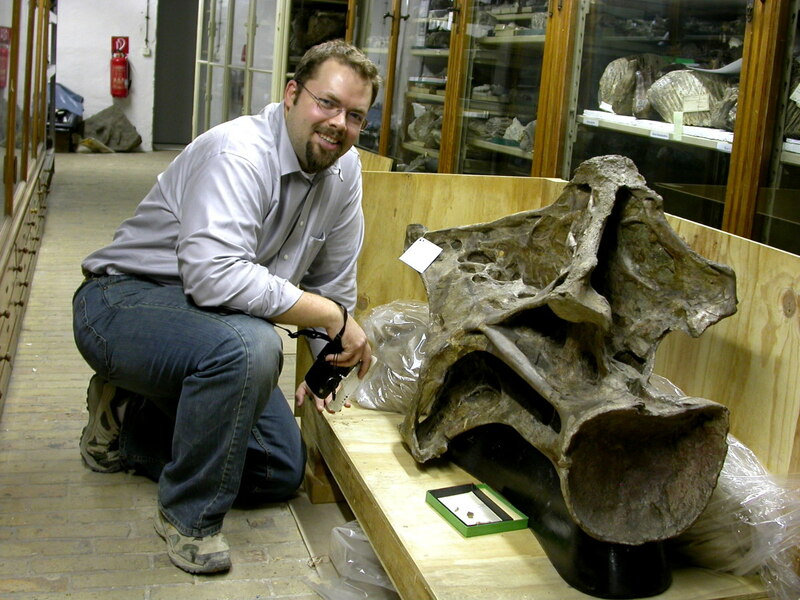 A blown skull of a proboscidean from the bone cellar at the Humbolt Museum. 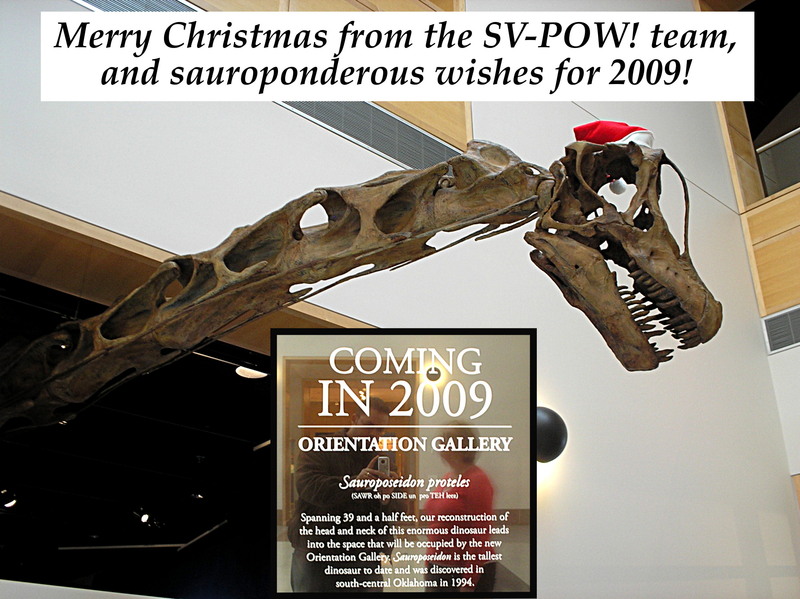 I snapped this on the last day in collections, on a mad scramble to get whatever non-sauropod pics (gasp!) I might want later. The bumps to the upper right are the occipital condyles; the skull is in left lateral view facing down and to the left. Paratympanic sinuses (green) surrounding the brain (blue) of an alligator, from David Dufeau’s homepage. Go there for a lot more mind-blowing images of sinuses. The snout of this gator is filled with paranasal sinuses, they’re just not shaded in here. Sectioned skull of a rhinoceros hornbill, which is pretty much completely filled with paranasal and paratympanic sinuses. Even the lower jaw is pneumatized. Archosaurs and mammals evolved cranial pneumaticity independently. Does that mean that cranial pneumaticity is easy to evolve (since it evolved more than once) or hard to evolve (since it only evolved twice)? This is relevant to the question of how many times postcranial pneumaticity evolved. Archosaurs evolved cranial pneumaticity before they evolved postcranial pneumaticity. Does that mean that postcranial pneumaticity is the application of a pre-existing developmental program (bone pneumatization) to a new anatomical region (the postcranial skeleton)? Or did the developmental control of pneumatization have to evolve de novo in the postcranium? The development of cranial pneumatization in mammals and postcranial pneumatization in birds seems to follow similar rules. Does that mean that we can apply lessons learned from, say, the development of human sinuses to understand the development of sauropod vertebrae? 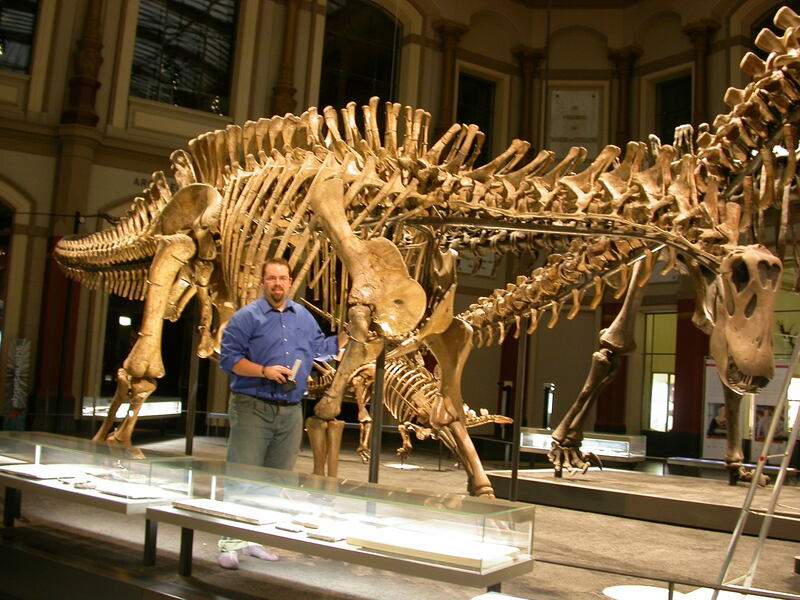 Sauropods and big-headed mammals like elephants have this in common: at the front end they’ve got a big chunk of pneumatic bone. In sauropods, it’s the neck; in elephants, it’s the head. In both cases the big pneumatic organ makes up close to a tenth of the animal’s volume. I don’t know what else to make of that, but maybe you can get mileage out of it at a cocktail party. I posted these because I was inspired by Darren’s post on dome-headed elephants, because they’re cool, to maybe demystify sauropod pneumaticity a little, or perhaps to re-mystify skeletal pneumatization in general. You have a pneumatic cavity between your brain and your monitor right now. How much time have you spent thinking about that (when you didn’ t have a sinus headache)? Next time: more Berlin goodness. UPDATE: By utter coincidence, Ohio University put out a news story about Larry Witmer’s work on sinuses yesterday. Hat tips to Yasmani Ceballos Izquierdo, who posted the link on the DML, and to Mike for sending it on to me. 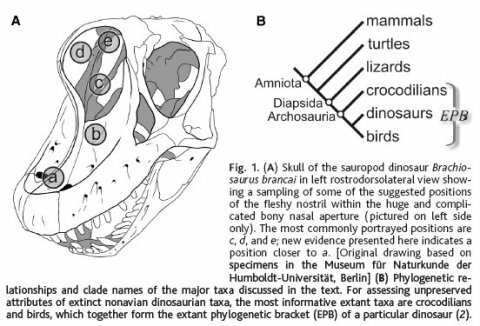 As long as you’re going over there, remember that Larry is one of the Good Guys and puts his papers up for public consumption; the new dino sinus paper is here. It’s great, but it makes the pictures I used here look pretty pathetic. Go have fun!